Bob picked the right morning to visit the church today - he was obviously better at predicting the first egg than I was yesterday! First egg was laid at 10:28 this morning and the act was spotted by Elaine, the Assistant Church Administrator as she passed the TV screen on her way to the photocopier. 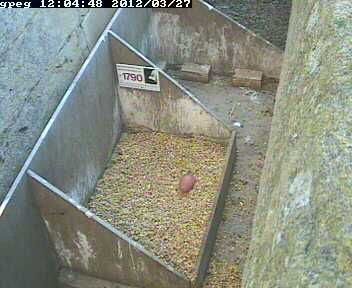 If all goes to plan the second egg may be expected around 7 pm on Thursday. We seem to have an intermittent problem with the webcam feed which we are trying to resolve so please bear with us. Note the time has been changed this morning to BST. 21st March 2012 - The male in the nesting tray.